Of course animals can be called characters!!! Dodger was pure awesome. I read this book and it was terrific. Can't wait until the next and unfortuanely the last, book comes my way. I cannot wait to read this one..
Lisa is one of my fav new finds in the last couple of years. love her historical and contemps.. I heard so many wonderful things about this book and too the upcoming one, 5th in this series. 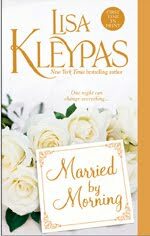 I love reading Lisa Kleypas but yet to read this series. That's about to change soon! Beautiful reading your review! You give so much into the feel of this book, which I love to get out of my reads too!